Home › Advice › Signage clutter: what is it and how is it reduced? Signage clutter: what is it and how is it reduced? Roading authorities need to convey a certain amount of information to help you drive. Regulatory and advisory signs, street signs, road markings and traffic signals have to compete against advertising hoardings, vehicle signage and other distractions on and off the road. In this article you’ll find out what signage clutter is, what roading authorities do to try to reduce it, and what the future of signage might be. Work is always being done to make signage as clear and direct as possible because every time you look at a sign, your eyes are temporarily diverted away from the road. These initiatives can be related to sign design, reducing unnecessary signage, or restricting what non-official signage can be displayed by, for example, local councils limiting the use of sandwich boards on pavements. 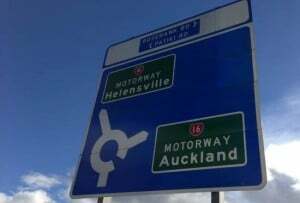 As an example of both changing sign design and reducing the number of signs, NZTA redesigned motorway signs in 2011 to be larger, but carry more information. This meant that your eyes only had to focus on one sign rather than two or more to get the same amount of information, and the information was re-presented in a way that was more immediately easy to interpret and digest. Fewer signs also mean less maintenance, and therefore less costs, so there are more than just benefits for drivers. Additionally, each sign requires some way of displaying the sign – usually a post (but occasionally a gantry), and by removing a sign you remove an obstacle that vehicles can hit in an accident. Striking a balance between too many signs and not enough has always been a challenge. However, there are examples of towns and villages in Europe and Scandinavia that have almost completely removed road signs and have found that it has reduced accidents. Signs are mostly ugly and therefore having fewer of them improves the environment. In many cases, signs that indicate road conditions and directions can be removed if the design of the road itself is changed. There’s no legal requirement to provide signs. Signs should only be provided where there’s a clear need and should be minimal, safely positioned and unintrusive on the environment (but not to the point where they are invisible or difficult to see by those that need them). Traffic sign clutter tends to increase over time if additional signage is installed without considering the existing signage. It can result in excessive signing. Good sign design and combining signs, like in the motorway example mentioned above) can prevent clutter happening. When drivers are forced to look at multiple heights and in multiple locations, it can cause confusion. The image here is a Google Street View image of Customs St, Auckland, where the buses can turn into Britomart (it was raining when I wanted to take the photo). 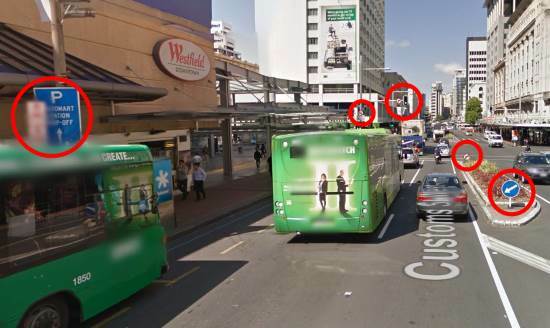 As you can see by where I’ve placed the red circles, your eyes have to search for signs at multiple levels while you negotiate buses, pedestrians and other road users in what is a fairly complex road junction. The reason I give this as an example is because I accidentally turned left where the ‘no left turn’ sign is because I didn’t see the sign. Roading authorities remove unlawful traffic signs where the signs might cause confusion. This doesn’t mean that all unlawful signs will be removed. 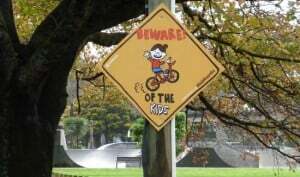 For example, this sign near the Victoria Park skate park is not official, but has been in place for some time and is only on the right-hand side of the road, therefore doesn’t interfere with the other signs on the left-hand side. Some signs could be considered to be useless and overkill. For example, a few metres up Beaumont St from the ‘Beware of the Kids’ sign above is this traffic island with two arrows pointing left. It may be that NZTA considers the road confusing as there are two lanes heading towards Fanshawe St, but only one lane heading towards College Hill. However, this island is half way along the road, therefore the confusion should have been apparent long before a vehicle reaches this sign, especially as the traffic is separated by a median strip almost the whole distance. While the above type of regulatory signs are important in the right place, warning signs are arguably more important as they point out potential dangers such as a sharp corner, pedestrian crossing or roundabout. Overuse of warning signs dilutes their effectiveness. An example of potential duplication in warning signs is showing a roundabout on an intersection sign, as shown, but also showing a warning sign for a roundabout. This isn’t the case here, but examples of signage duplicate do exist. Many local signs are out-of-date and useless on a local community level. For example, many signs that show the way to a town church or hall are likely to only be used by locals who would almost always know where it is. Those coming from out of town would simply have the address and use a map or satellite navigation. Often these signs are falling into disrepair, such as the one shown, which is in an old style and may have been there more than two decades. It occupies a separate wooden pole next to the traffic light pole. The image shown is at the bottom of College Hill showing an old ferry sign pointing down Beaumont St. When a driver gets to the bottom of Beaumont St there is no other signage to tell them to turn onto Fanshawe St to get to the ferry terminal, just a blue sign that says ‘Downtown’. 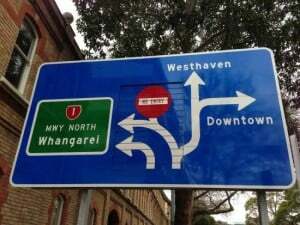 The only other direction sign on Beaumont St is this sign showing Whangarei, Westhaven and Downtown. Some tourist destination signs are important, but they should be no more than a few kilometres away from the attraction itself, or only signposted on a major route if the attraction requires drivers to turn off the route. Read our guide to tourist signs here. 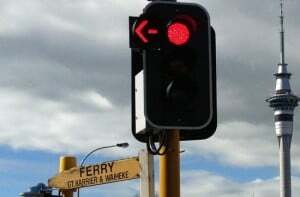 New Zealand has a huge problem with temporary signs accidentally forgotten by road workers. When road conditions have changed, such as when a road layout has been altered, notification only needs to be given for a short period of time to let frequent users know about the changes. Infrequent users might not remember the exact layout and will drive to the conditions. Removal of road markings reduces the need for maintenance. 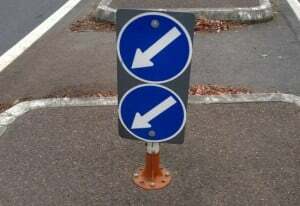 Some markings such as ‘slow’ may not be needed if supported by other signage. Road markings are also slippery for motorcyclists when it’s wet. Signs should be mounted where they are visible. As you can see in the Customs St example above (under ‘excessive signing’), it can be difficult to see every sign when signage is placed at different heights. If unnecessary signs are lit this is a waste of power, and it’s another thing that requires maintenance. Lights are also expensive to create and install. Identifying and rectifying signage clutter improves the streetscape by identifying and removing irrelevant, damaged, worn out and unnecessary signage. It rationalises the signs to make sure they’re only provided where needed. It reduces maintenance costs (cleaning, replacing, cutting foliage, etc), and reduces overheads (power for lighting). Finally, it improves the environment for the motorist by giving a less cluttered visual experience as they are driving. This article has highlighted how one short stretch of road (Beaumont St in St Mary’s Bay, Auckland) can have multiple issues. But as we move more towards GPS-based maps in every car (or via smartphone) we might see a drop in the need for signage as these systems come with major landmarks and destinations pre-programmed and can direct drivers to them. Intelligent systems that understand the roading network and can watch for danger will also play a large part in the future in allowing drivers to drive safely on any road – the vehicle will assume control if there’s danger.